The city of Oaxaca is bustling, colorful and festive. But one of its great charms is that it has many quiet spaces where you can retreat from the hub-bub and find yourself surrounded by tranquility and beauty, manifested in art, architecture, nature, or the local people. One such tranquil spot is the Ethnobotanical Garden, located right in the heart of Oaxaca’s historical center. The Ethnobotanical Garden is part of the Santo Domingo Cultural Center which also includes the Oaxacan Museum of Cultures, the Francisco Burgoa ancient books library, and the Nestor Sanchez periodicals library. The garden is located behind the church and former convent, and unfortunately, many visitors miss it. Mexico is among the most biologically rich countries in the world; it is considered to be “megadiverse” because of the great number of species of plants and animals that inhabit its territory. Of all of Mexico’s 31 states, Oaxaca is the one with the most biodiversity. This is no doubt because of its varied terrain, with over 500 km of coastline, as well as mountain ranges of up to 3500 meters above sea level. This also accounts for Oaxaca’s great ethnic diversity: no less than 16 ethnic groups live in Oaxaca, and have since ancient times. The garden is a microcosm of Oaxaca’s rich biodiversity. Its goal is to preserve Oaxaca’s endemic flora, and to allow visitors to appreciate the state’s botanical diversity, as well as to gain understanding about human interaction with plants throughout history. This is the first modern, public botanical garden in the state, and the emphasis on the natural history of the local plants and their cultural importance makes this a fascinating visit even if you’re not interested in botany. The area that today serves as the garden covers about 2 hectares and was part of the property of Santo Domingo convent, which functioned from 1608 until the 1860s. When the Reform Laws were brought into effect in the 1860s, religious orders in Mexico were dissolved, and the government nationalized all church property. The entire Santo Domingo complex, including the church, convent and surrounding property then served as a military base for many years. In 1898 the church was returned to the Dominicans, but the military did not completely evacuate the premises until 1994. After the military departure, the former convent underwent an extensive restoration project which finished in 1998, when the Santo Domingo Cultural Center was inaugurated, but the work on the garden was just beginning. The first plants were put in during the summer of 1998, and the garden opened to the public in 1999. The plants come from all around Oaxaca state. There are over one thousand species of plants in the collection, but this is just a fraction of the wide variety of plants that can be found in Oaxaca. It is a relatively new garden; but several large and old plants have been successfully transplanted here, including an impressive Biznaga cactus which is several centuries old. The garden is divided into several different zones. There’s one section for food plants, where you can see corn along with its ancestor teosinte, as well as squash, beans and chiles and other less well-known plants that are used in Oaxacan cuisine. You’ll learn about the domestication of plants, which began in Mesoamerica around 10,000 years ago; the evidence for this was found not far away, in the cave of Guila Naquitz, which is included within the UNESCO World Heritage site of the Prehistoric Caves of Yagul and Mitla. There is a zone which shows plants that were in use in very ancient times, a humid tropical forest zone, a pine and oak forest zone, and a dry zone. A water catchment system collects rain water from the roof of the former convent, which is channeled to an underground cistern with a capacity of over one million litres. The collected water is used to irrigate the humid zones of the garden. Since Oaxaca has issues with water supply, this ensures that the garden is not dependent on outside sources of water. 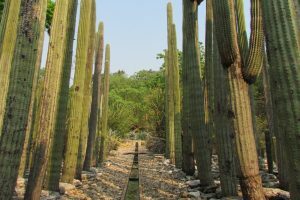 The Ethnobotanical Garden is a lovely and serene green space, within the bustling Oaxaca city center. A visit here is both enjoyable and enlightening. The Ethnobotanical Garden may only be visited as part of a guided tour offered by the garden. Tours are offered in English on Tuesdays, Thursdays and Saturdays at 11 am; in French on Tuesdays at 5 pm; and daily in Spanish at 10 am, 12 noon AND 5 pm, except Sundays. Arrive ten minutes in advance to purchase your tickets. The entrance is on the corner of Reforma and Constitución streets.